Bordered by China, Nepal, and Bhutan, Sikkim has long been regarded as one of the last Himalayan Shangri-las. The state was an independent kingdom up until 1975 when it was taken over by India following a period of anti-royal riots and political unrest. Because of its remoteness and the fact that permits are required, Sikkim isn't the most accessible area to visit in India. However, it certainly is one of the most energetic and refreshing. There's something very soothing to the soul about the mountainous beauty and ancient Tibetan Buddhist culture in Sikkim. Although the state is only small, its vertical terrain makes it very slow to traverse. Keep in mind that it can take hours to travel what looks like a short distance. Here are the top attractions and places to visit in Sikkim to include on your itinerary. Gangtok, the capital of Sikkim, is constructed on a cloudy ridge 5,500 feet above sea level. When the clouds clear, it's possible to see all the way to Khangchendzonga's soaring peaks (the world's third-highest mountain, Khangchendzonga National Park was listed as a UNESCO World Heritage site in 2016). The city is refreshingly clean and well organized, and most tourists spend a couple of days there to make travel arrangements and see the sights. It's a popular base for those heading off on treks. Unfortunately, Sikkim currently doesn't have an airport (one is being built in Pakyong near Gangtok and it's scheduled to open in 2016). Getting to Gangtok requires a four-hour drive from Siliguri in West Bengal, where the nearest trains station is. The nearest airport, at Bagdogra, is about 45 minutes from Siliguri. In a testament to the fact that Sikkim is a marvelous place for meditation, almost 200 monasteries dot the divine hilltops. The most visited monasteries in Sikkim are Rumtek (overlooking Gangtok), Pemayangtse (near Pelling in West Sikkim), and Tashiding (also in West Sikkim). Other monasteries that are worth visiting include the Karma Kagyu monastery with its 200-year-old murals (in Phodong in North Sikkim), the Enchey monastery (in Gangtok), and the old Sanga-Choeling monastery (only accessible on foot from Pelling). The monasteries hold many festivals, particularly around Losar in February/March. Tse Chu, in July, features Buddhist dancing at Rumtek. Enchey also hosts a Chaarm festival in December/January. Nathu La, 3 hours east of Gangtok on the Chinese border, was a major passageway on the Old Silk Route between India and Tibet before it was closed in 1962. The border consists of a lone barbed wire fence, and you'll get the strange thrill of seeing the Chinese soldiers on the other side. Unfortunately, only Indians are allowed to travel this far though, and only on Wednesdays, Thursdays, Saturdays, and Sundays. A special permit is also required and can be obtained through a registered travel agency in Gangtok. With a permit, foreigners can go up to Tsomgo Lake, also called Changu Lake, 27 kilometers (17 miles) short of Nathu La. This spectacular high-altitude (12,400 feet) glacier lake remains frozen until May. 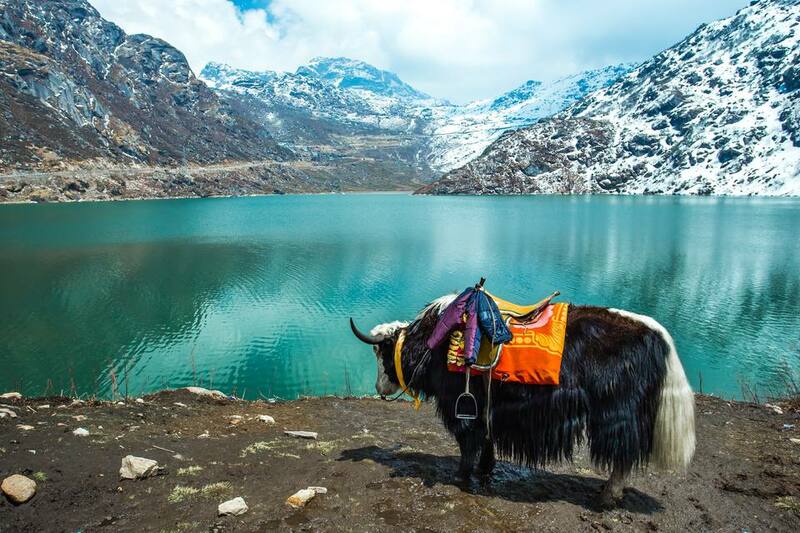 For a quirky experience, ride a yak there! Sikkim is renowned for its astounding variety of birds, animals, and flowers -- over 450 species of birds, 400 species of butterflies, 450 varieties of orchids, and 40 species of rhododendron. Varsey Rhododendron Sanctuary, situated in the Singalila Range in the southwest corner of West Sikkim, is a must-visit place during late spring. You'll find Maenam Wildlife Sanctuary near Ravangla in South Sikkim. The Shingba Rhododendron Sanctuary is also a highlight near Lachung. Closer to Gangtok, there's the Deorali Orchid Sanctuary in south Gangtok (visit from March to early May and the end of September to early December), and Fambong Lho Wildlife Sanctuary around an hour west of Gangtok. Kyongnosla Alpine Sanctuary is located about an hour east of Gangtok, on the way to Tsomgo Lake and Nathu La ( visit from June until October). You can also stop off at Jawaharlal Nehru Botanical Garden on the way to Rumtek monastery. Contact Help Tourism for birding, butterfly and other wildlife tours in Sikkim. Sikkim is a trekker's paradise and historical Yuksom is the gateway for treks towards Mount Khangchendzonga. The trek from Yuksom to Dzongri Peak and Rathong Glacier, and further on to Goecha Peak if you're up for the challenge, is the most popular trek in Sikkim. It passes through the unspoiled forests, magnificent rhododendron gardens, and powerful rivers of Khangchendzonga National Park. Allow seven to 10 days from Yuksom to Goecha Peak and back. March to May is the ideal time to go. Additional permits are mandatory for foreigners. If you want to go on an organized trek, Mountain Tours gets excellent reviews and is recommended. It's run by the family of mountaineer Late Da Namgel Sherpa, who was part of the first successful Everest expedition team in 1953. In far North Sikkim, 6 hours from Gangtok and 9,000 feet above sea level near the Tibetan/Chinese border, Lachung and the Yumthang Valley dazzle visitors with dramatic pristine scenery. Lachung served as a trading post between Sikkim and Tibet before Tibet was annexed by China. Now, it's the base camp for the renowned Rhododendron Valley Trek from Yumthang Valley to Lachen Valley. Other attractions in the area are Lachung monastery, Yumesamdong (Zero Point), and the astonishing high-altitude Gurudongmar Lake (it's one of the world's highest lakes, at more than 17,000 feet above sea level). North Sikkim is a restricted area and it's necessary to obtain a special permit to visit it. You'll need to make your travel arrangements through a registered tour company, which will also organize the permit for you. This can be done in Gangtok. Note that the Yumthang Valley is closed from December and March due to heavy snow, and foreigners are only permitted as far as the Chopta Valley (they cannot visit Gurudongmar Lake). Pelling, a 3-4 hour drive west of Gangtok, may be a rather charmless small town but it's the place to go for unparalleled views of Mount Khangchendzonga at dawn. Stay at Ifseen Villa, one of the top budget guesthouses and homestays in the Indian Himalayas. Apart from the views, monasteries are the main attraction, along with the ruins of Rabdentse. Previously the royal capital of Sikkim from 1670 to 1814, not much remains of Rabdentse these days. However, its location on a ridge provides a spectacular viewpoint. Overnight and day tours depart from Pelling by jeep and cover the major sights in the area. It's also possible to do a three-day combination jeep and hiking trip from Pelling to Tashiding (which has an atmospheric monastery on a hilltop) via Khecheopalri Lake. Alternatively, jeeps run from Pelling to Yuksom via Khecheopalri Lake, and you can hike from Yuksom to Tashiding in a day. On the way from Gangtok to Pelling, Ravangla is most notable for its Buddha Park with a towering 130-foot golden Buddha statue surrounded by manicured gardens. Palchen Choeling Monastic Institute (also known as the new Ralong Monastery) in nearby Ralong also houses a substantially sized golden Buddha. It's home to more than 100 monks, and you can hear them chanting in the early morning and mid-afternoon. There are a number of other monasteries that can be visited in the area as well. Halfway between Ravangla and Namchi, you'll find picturesque Temi Tea Garden. It's the only tea garden in Sikkim and the tranquil Cherry Resort is nestled amidst it. Namchi is also famous for its giant statues. It currently has two of them -- one Buddhist and one Hindu -- and a third one is apparently being planned. The Buddhist statue, of Guru Padmasambhava (credited with introducing Tantric Buddhism to the Hinalayan region), reaches around 140 feet tall. It has a commanding position on Samdruptse Hill, 7,000 feet above sea level. Not quite as tall but perhaps more impressive is the white 108 foot high Lord Shiva statue at Solophuk Hill, south of Namchi. The epic complex surrounding the statue contains guest houses and temples, including replicas of the holy Char Dham. River rafting is the latest adventure activity to arrive in Sikkim, and the Teesta River offers some world class opportunities. The major route is Makha-Sirwani-Bardang-Rongpo. Grade II to IV rapids are interspersed with placid patches to float along, and plenty of white sandy beaches exist for overnight camping. High cliffs and gorges, along with boulder-strewn river beds, add to the thrill. The Rangeet River, with its more turbulent waters, also offers advanced rafting opportunities from Sikip-Jorethang-Majitar-Melli. The best time for rafting in Sikkim is from March to May and October to December. An unexplored destination for those who want to get off the tourist trail, Zuluk is a tiny village nearly 10,000 feet above sea level in East Sikkim. It was once part of the Old Silk Route for traders, connecting Kalimpong in West Bengal to Tibet. Now, it's the first village along this route to offer homestay accommodations for visitors. The main attraction is the sight of Mount Khangchendzonga from Lungthung and Thambi View Point. Those who get car sick might want to avoid it though, as the very winding road has more than 30 hairpin turns! The landscape varies greatly depending on the time of year. It's carpeted in wildflowers from August to September and covered in snow from January until April. After the snow clears, there's abundant bird life. As Zuluk is a military-controlled area near the Chinese border, it's off-limits for foreigners. Indians require an Inner Line Permit to visit it, which needs to be obtained from the police station at Rongli in West Bengal. The permit will allow travel to Gangtok via Zuluk, Gnathang Valley, Kupup, Baba Mandir, and Tsomgo Lake. (If you want to visit Nathu La, a separate permit must be obtained in Gangtok). Travel agencies offer Old Silk Route tour packages.